Welcome to Dating Sites Reviews! This site offers detailed reviews of popular dating apps and dating sites. With our member and team reviews, you’ll discover how each service works, its features, and approximate cost. Most apps and sites offer a free dating profile, searching, and matching, but to communicate with someone you will have to purchase a subscription or buy credits. None of the popular dating sites and/or dating apps are completely free. To find out more information about each reviewed service, please click one of the sites and/or apps listed in the Reviews section. From here you can filter the dating services by category and type. You can also use our advanced Dating Service Search tool to further narrow your selection. Our Online Dating statistics wiki section includes a wealth of referenced facts about online dating in general and the top dating sites and apps. Do you want to write your own online dating app and/or site review? You can—and we invite you to join other members in reviewing the dating services you use! From our list of over 50 online dating site and app reviews you can add your experiences and opinion. Wherever you see the star rating for a dating site, simply click on the Add button beside it. If you’d like to view other users reviews, click on the View button. The average star rating is based exclusively on user feedback. If you have had a positive experience, a negative one or just want to tell others what you think a dating site does well or could improve on, submit your review! Are there legit adult sexual sites that aren't scams? Is Badoo a good dating site? Cannot login to POF... Anyone else have this problem? Last week MillionaireMatch reached 4 million registered members making it one of the largest dating services of this type. With hands on moderation of every new profile to make sure standards are met (all are manually reviewed within 24 hours), along with the ability for members to verify their income and profile image (once verified they are marked with a badge) makes this dating service one of the more popular choices for wealthy singles. After more than two years in the top spot, Netflix is no longer the world’s highest-grossing non-gaming mobile app. 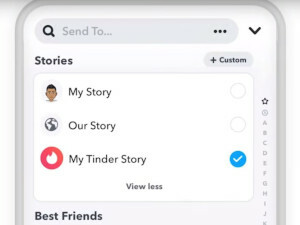 That title now goes to Tinder, which grossed $260.7 million from the Google Play Store and the Apple App Store in the first quarter of this year. App store intelligence firm Sensor Tower recently released its rankings of the highest grossing apps in the United States and worldwide for Q1 2019. Overall, global app revenue reached $19.5 billion last quarter, up nearly 17 percent year-over-year. Consumer spending on Apple’s App Store totaled approximately $12.4 billion globally, while Google Play revenue grew 20.2 percent year-over-year to approximately $7.1 billion. The world is increasingly moving to mobile, and for companies that are prepared to capitalize on the change, the potential for profit is huge. HBO is set to air the eighth and final season Game of Thrones this month. For the show’s devoted viewers, it will be sad to say goodbye, but OkCupid is making sure fans won’t have to suffer alone. 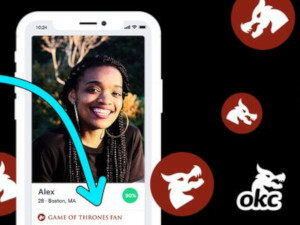 Users who publicly answer “yes” to the question “Do you watch Game of Thrones?” will now receive a profile badge prominently declaring their love for the series. 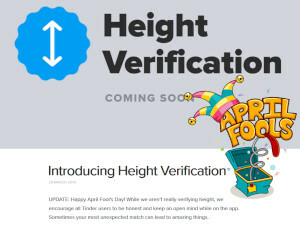 OkCupid predicts the badge will lead to 20% more likes and 15% more conversations for those who have it on their profiles. The idea may sound silly, but Game of Thrones has over 2 million mentions on OkCupid profiles. Shared interests are, if not a predictor of deep compatibility, then at least a good conversation starter. Television is something singles want to connect over. Tinder made headlines in 2016 when a Fast Company article revealed the dating app’s most closely guarded secret: every user received an internal rating that ranked the most (and least) desirable people on the platform. Then-CEO Sean Rad confirmed the existence of the algorithm, called an “Elo score” in reference to a ranking system used by chess players, but declined to go into detail. The story spread rapidly and left many users with a bad taste in their mouths. Dating app users are already subjected to judgement after judgement at each other’s hands - does anyone want to feel judged by the app itself, too? Why should Tinder get to decide who is desirable and who isn’t, or who is and is not out of someone’s league? In just five years, Bumble has become a dominant voice in the digital space. The company expanded its initial dating-focused product to become a platform for meeting friends and a tool for business networking. Outside of the app, Bumble’s numerous ventures include a startup investment fund, entertainment industry initiatives, pop-up installations and brand partnerships. Bumble has proved it is one of the most ambitious leaders in the dating industry, so few fans - or detractors - will be surprised to hear the company has yet another launch on the horizon. 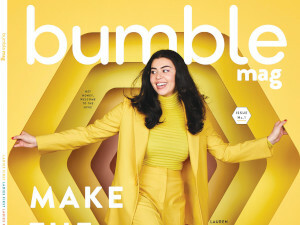 Bumble’s newest endeavor is Bumble Mag, a lifestyle publication created in partnership with Hearst Magazines’ branded content studio, HearstMade. The first issue features fashion entrepreneur (and real Bumble user) Lauren Chan on the cover and 100 pages of articles about dating, careers, friendship and other topics of interest to Bumble’s 50 million-plus users. 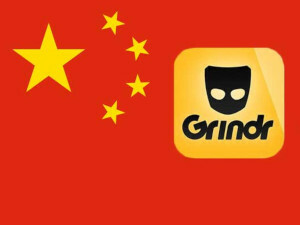 Are there legit adult sexual site..
How many dating apps and/or websites do you use at any one time? 0, I have not tried any yet.